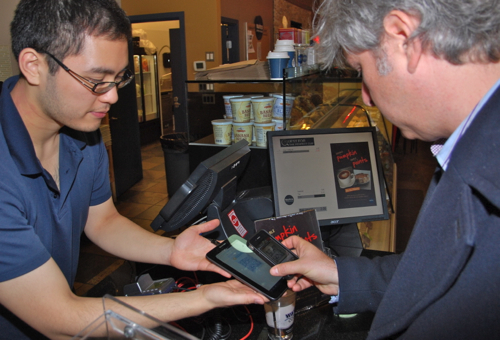 The machine, delivered to Vancouver by Robocoin, an American manufacturer, stands against a wall of a popular coffee shop. It resembles an ordinary cash ATM. Customers lined up here on October 29, 2013, to use the ATM, then used their smart phones to buy coffee and muffins at the Waves coffee shop. The ATM is the world’s first, said co-owner Mitchel Demeter, a local entrepreneur who started trading in bitcoins several years ago, then earlier this year with two partners set up Bitcoiniacs, a Vancouver storefront money exchange. He and his friends, who were high school students together, said they saw ATMS as a business opportunity. “Nobody had an ATM, everyone was buying and selling on web sites,” said Demeter. Customers use a private key – like a bank PIN number – to access their online account of bitcoins on the ATM. They withdraw cash equivalents (the conversion rate is currently about one bitcoin for $200) from their bitcoins, or deposit Canadian dollar bills. 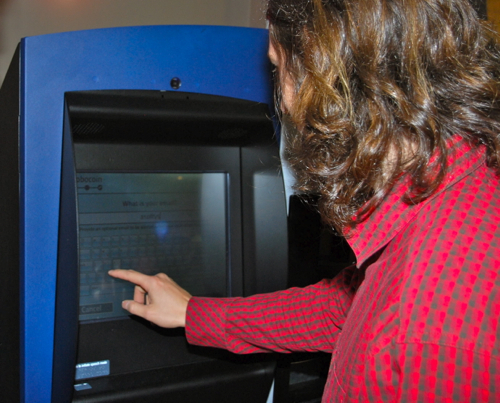 The machine transfers the money on the Internet via the Canadian VirtEx exchange. “It’s the currency of the Internet, as real as any other,” said Demeter. And earlier this month investors were startled when a senior investment officer with giant hedge fund Fortress Investment Group said bitcoins could be used as a cheaper way of transferring money in countries with weak banking systems, reported the Financial Times. Encryption – a public and a private key are required for each bit coin transaction – allows the money to be tracked, contrary to popular perception, said Bitcoiniacs partner Cheyne Mackie. “People call it anonymous, but it’s probably the most open currency there is,” he said. One of the ATM’s first customers was Mike Yeung, a business student at the city campus of Simon Fraser University, where he helped set up a university bitcoin club, one of a handful of such clubs in the world. The club’s mission “is to educate people about bitcoin so they can adopt bitcoins in their everyday lives,” he said. “I think bitcoins are the wave of the future, because they provide maximum value and efficiency,” said Yeung.